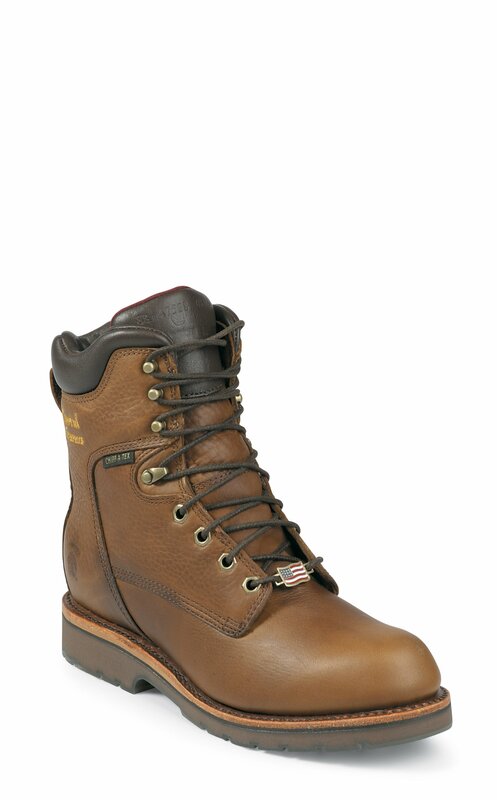 The McKelvie Waterproof 8, 8-inch tall men's lace-up boot is built for protection and comfort with a golden tan leather exterior with the Chip-A-Tex® waterproof membrane system that's breathable. Water is locked out of the boot by the membrane shield but air passes through from the foot for maximum comfort. It has Texon® 460 waterproof insoles that allow for a relaxed and comfortable fit and a triple ribbed steel shank for stability. With 400 grams of 3M Thinsulate™ Ultra, this interior layer is lightweight, breathable, and moisture-resistant. It's thick for even greater warmth and comfort, yet still thin enough to allow complete freedom of movement and designed for some of the harshest conditions yet retains insulating value in damp environments. Its Vibram® outsole guarantees maximum traction on wet or dry surfaces and various terrain. Made in the USA with global parts. I am a siding & roofing contractor. Been wearing these boots for over 20 years in New England. Normal boots will last me 6 months. These boots will last 1 year. This boot is the do all boot. Great leather, insulation, waterproofing and excellent sole. I am buying 2 more pairs right after I type this. I've owned over 5 pairs of these boots. they are the best. it's my only footwear I wear, ever. super comfortable. very durable. soles are non marking and have smaller lugs. I install floors so they are perfect to not mess up a new floor. I also own a few pairs of the 6" version too which are nice for warmer temps.